Another independent venue closing down so that some nameless, faceless corporation can further blandify our highstreets. Yuk. 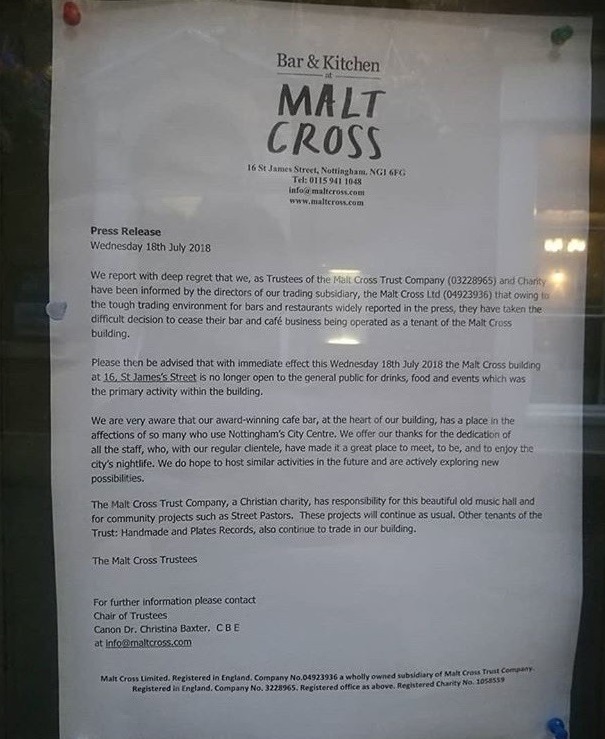 News broke yesterday that the much-loved Nottingham venue Malt Cross had closed, basically overnight. With staff reeling and patrons fuming, the local press have whirred up and social media is buzzing with disgust, disappointment and devastation. The Malt Cross, to paraphrase a riff on the place, is/was a social hub, an amazing building, architecturally significant and basically unique. It was home to Crosswords spoken-word night, a gallery, quizzes, life-drawing classes and has been home to Writing East Midlands and Mouthy Poets events. It has disabled access and is really affordable as an event space. The staff are great, too. It sounds like the event spaces will continue to operate, the sign on the door says “we are actively exploring new possibilities” but in the meantime we have lost a social hub for creative people who don’t want to sit in another Wetherspoons. It was a good place, and the general consensus is – it shouldn’t be closing. This argument is an echo of many others. Replace ‘independent venue’ with independent bookshop, or local writing group or spoken word night or local shop. Or even with ‘why are publishers not taking chances on new writers’ or ‘why is there no decent arts provision in my town’? The answer to all of them is simple – if uncomfortable – because we weren’t willing to pay for them. Publishers would publish more debut novelists if debut novels sold. Poetry nights would keep going if folks were willing to pay a few quid to attend. Shops don’t close because they are tired of serving the bulging masses coming through the doors. It has always been a case of use it or lose it. The independent world is dying. The creative world stays afloat because it is heavily subsidised by the government. Yes, that’s the reality. The government pays hundreds of millions of pounds to keep unprofitable arts and cultural organisations afloat. And we’re all so used to it. Free museums, almost free courses, incredibly cheap or free exhibitions, performances and opportunities. So much so, that when anybody asks us to pay the true cost of a ticket, we reel, the true cost of an independently run venue, we scoff, a few extra pence to buy beans at the local shop instead of Tesco – we run a mile. Cue the voices of those saying, but we can’t afford it, times is hard and all that. I get it. But that’s not everyone. That’s not every person in a city. If the ones who can, did, then the ones who can’t, could. That simple basically. We can’t complain about the loss of wildlife, and then dig up our grass and replace it with plastic. We can’t Tweet about the lack of independent shops, as we rip open another box from Amazon. We can’t complain that our favourite venues are closing, if we never went – or only ever asked for freebies. And we can’t complain that they don’t publish new writers, if we’re not willing to pay nine quid and take a chance on a debut novelist. Put your money where your mouth is. We are not complaining about the masses, we are the masses.